... and too many things I just don't remember! I decided to see how I could make that setup a bit more portable and easier to deploy. That's where Vagrant kicks in along PyCharm and Anaconda! The following guide assume that you have that you have PyCharm installed and are using macOs, although it should pretty much be platform agnostic. You should now have a colour-vagrant directory nested into the colour-science one. Let's open the colour-vagrant directory into PyCharm. We will loosely follow Jetbrain's PyCharm Documentation. Fabric does not support Python 3 yet thus if you want to use Python 3 you will need to switch to the fork. Install XQuartz: This is the X11 display server for macOs. The virtual machine will export the display to it so that you can see the figures from Matplotlib. VirtualBox directories syncing performance degrades quickly with large number of files. As a result the directories syncing is done with NFS. You will however be asked for your macOs password at each virtual machine spin up because Vagrant needs to modify configuration files on the macOs host. 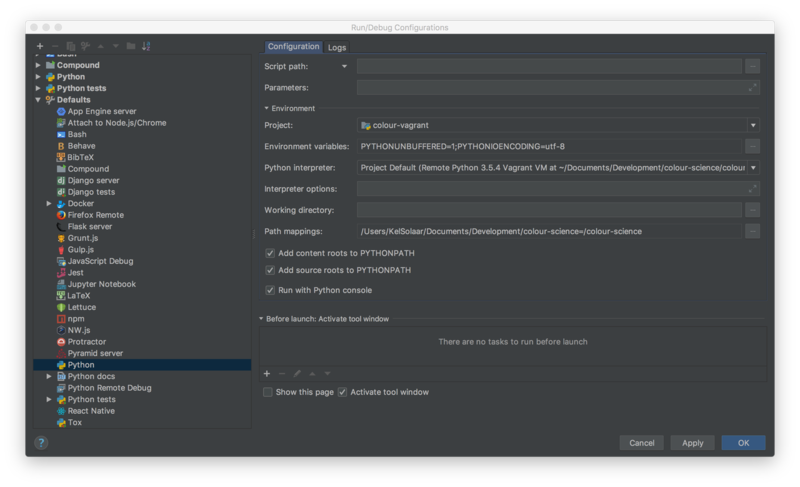 The canonical way is to use Vagrant from the command line as described in Vagrant Documentation, but here we will leverage the PyCharm integration. Set the Vagrant Executable field to your Vagrant executable, e.g. /usr/local/bin/vagrant. This should not be needed as vagrant should be enough, but I encountered issues lately. Set the Instance Folder field to your colour-vagrant directory. 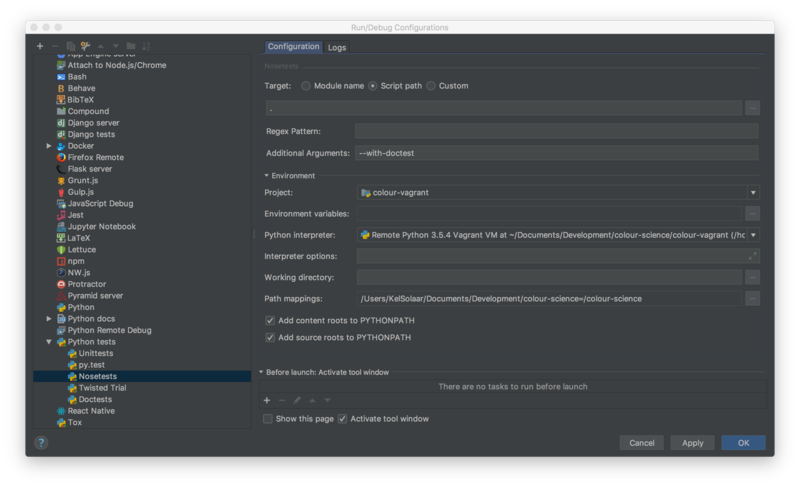 Add the vagrant-fabric plugin to PyCharm in the Plugins tab. With everything setup, hit the PyCharm ---> Tools ---> Vagrant ---> Up menu item to spin up the virtual machine. You can go grab a coffee, the initial provisioning will take roughly 25-30 minutes. colour, colour-notebooks and colour-science.org repositories cloned into the colour-science directory right next to the colour-vagrant one. Accessing the virtual machine is done by using PyCharm ---> Tools Start SSH session... menu item.